You must understand how to configure a Cisco router to succeed on the exam—or to succeed in supporting Cisco routers. This section covers the basic configuration processes, including the concept of a configuration file and the locations in which the configuration files can be stored. Configuration mode is another mode for the Cisco CLI, similar to user mode and privileged mode. User mode allows commands that are not disruptive to be issued, with some information being displayed to the user. Privileged mode supports a superset of commands compared to user mode, including commands that might harm the router. However, none of the commands in user or privileged mode changes the configuration of the router. 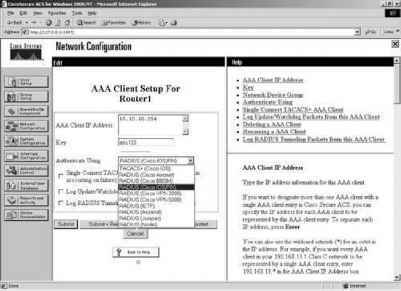 Configuration mode is used to enter configuration commands into the router. Figure 7-3 illustrates the relationships among configuration mode, user exec mode, and privileged exec mode. Commands typed in configuration mode update the active configuration file. These changes to the configuration occur immediately each time you press the Enter key at the end of a command. Be careful when you type in a configuration command! Configuration mode itself contains a multitude of subcommand modes. Context-setting commands move you from one configuration subcommand mode to another. These context-setting commands tell the router the topic about which you will type the next few configuration commands. More important, they tell the router what commands to list when you ask for help. After all, the whole reason for these contexts is to make online help more convenient and clear for you. So, if you are confused now, hang on—the next sample will clarify what I mean. NOTE Context setting is not a Cisco term—it's just a term used here to help make sense of configuration mode. The interface command is the most commonly used context-setting configuration command. As an example, the CLI user could enter interface configuration mode after typing the interface ethernet 0 configuration command. Command help in Ethernet interface configuration mode displays only commands that are useful when configuring Ethernet interfaces. Commands used in this context are called subcommands—or, in this specific case, interface subcommands. If you have significant experience using the CLI in configuration mode, much of this will be second nature. From an INTRO exam perspective, recalling whether popular commands are global commands or subcommands will be useful, but you really should focus on the particular commands covered here. As a side effect, you will learn whether the commands are global configuration commands or subcommands. No set rules exist for what commands are global commands or subcommands. Generally, however, when multiple instances of a parameter can be set in a single router, the command used to set the parameter is likely a configuration subcommand. Items that are set once for the entire router are likely global commands. For instance, the hostname command is a global command because there is only one host name per router. The interface ethernet 0 command is a global configuration command because there is only one such interface in this router. Finally, the ip address command is an interface subcommand that sets the IP address on the interface; each interface has a different IP address. Use Ctrl-z from any part of configuration mode (or use the exit command from global configuration mode) to exit configuration mode and return to privileged exec mode. The configuration mode end command also exits from any point in the configuration mode back to privileged exec mode. The exit command backs you out of configuration mode one subconfiguration mode at a time.